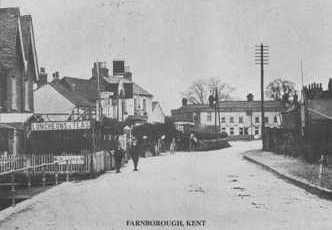 FARNBOROUGH, Kent, to be distinguished from the better known Farnborough in Hampshire and from places of the same name in Berkshire and Warwickshire, is a village on the high road to Sevenoaks, Tonbridge and Hastings, 14 miles from London, and about 350 feet above sea level. It lies on the northern slope of the North Downs, partly on chalk and partly on the edge of the Thames basin. Bones of the mammoth have been found in the flint pit on Green-Street-Green, and palaeolithic flint implements are plentifully scattered over the fields. A small piece of common is known as Leach's Green from the family of the same name, still resident, whose house adjoining the common was only pulled down when the present Board School was built. 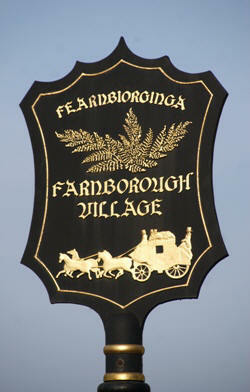 The name of the village derives from Feambiorginga or village among the ferns on the hill. Records date from 862AD when Ethelbert, King of Wessex gave away 950 acres at Farnborough. The village is not mentioned in the Doomsday Book although the manor existed in the middle ages, and in the 1200s was held by Simon de Montfort. The section of the High Road between Bromley and Sevenoaks became a turnpike road in 1749. This was of considerable importance to the development of the village, which provided services and provisions to the coach operators and their passengers. This heritage is reflected in the village sign, see above. The central part of the village retains a shape and character that would be recognisable to a visitor from many centuries past. 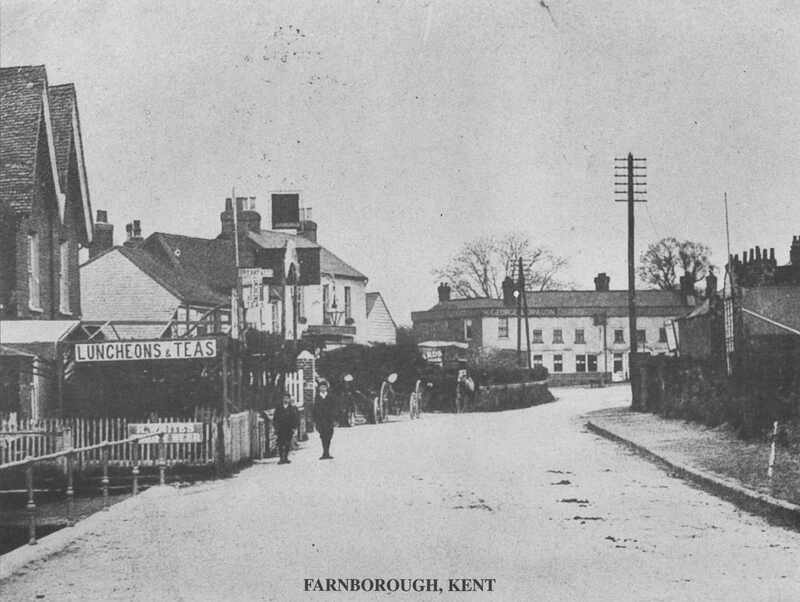 One reason for this is that the railway never came to Farnborough, although there were many proposals. On this page are some historical photos taken in the early part of the twentieth century, contrasted with modern photos of the same locations. 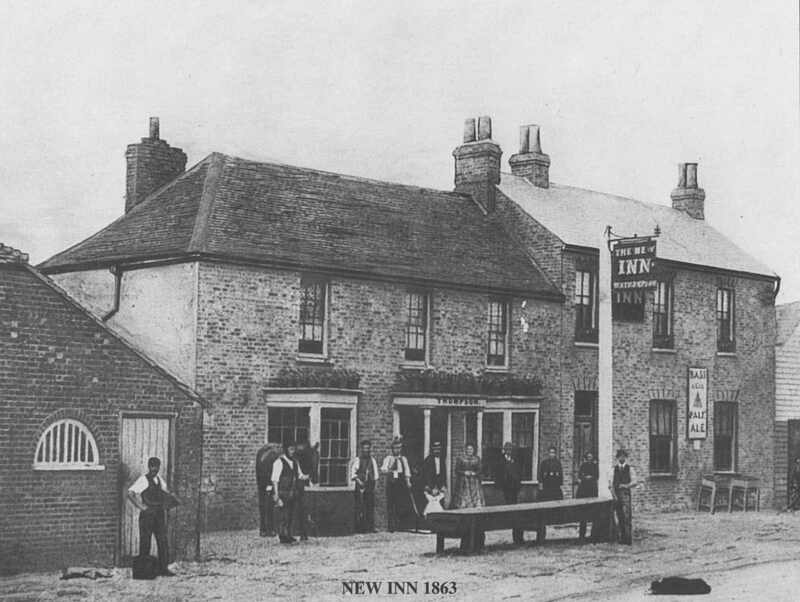 Coaches and horsemen were accomodated at the pub that now bears the name 'The Change of Horses', but was named for centuries 'The New Inn'. The principal building at this junction was for many centuries the George and Dragon Inn. This existed in the 16th Century, and was used as a coaching inn. The George and Dragon was replaced by The George in 1937. This was in turn demolished after the start of the current century to make way for the new housing adjoining the junction between Church Road and the High Street. For many years the triangle by the George and Dragon where Church Road meets the High Street was used as a turning and parking area for bus route 47, and from 1949 route 51. It was landscaped by Bromley Council in 1985 to enhance the Conservation Area. Church Road retains the rural character of the past and the path through the lychgate connects Church and Village. The historic buildings in Church Road include No. 3(19th Century), No. 5, with the overhanging weatherboarding, Nos. 15 and 18 (18th Century) and No. 20 (17th Century).